Like many little girls, my daughters LOVE jewelry! The love receiving costume jewelry pieces as gifts, love wearing my wedding and engagement rings, and they certainly love making their own necklaces and bracelets. 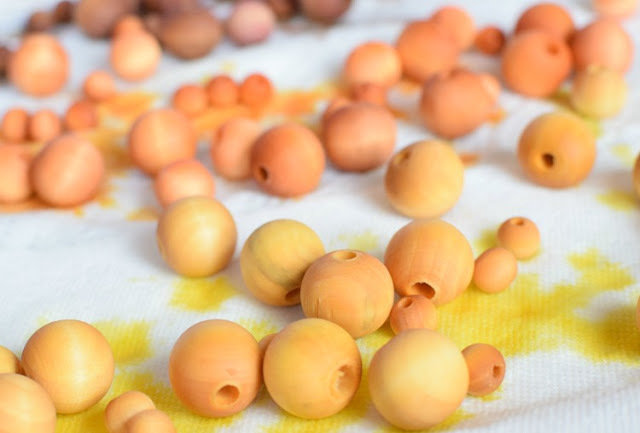 As fall approaches, we made these beautiful wooden bead necklaces, dyed in pretty shades of yellow, orange, red, and brown. 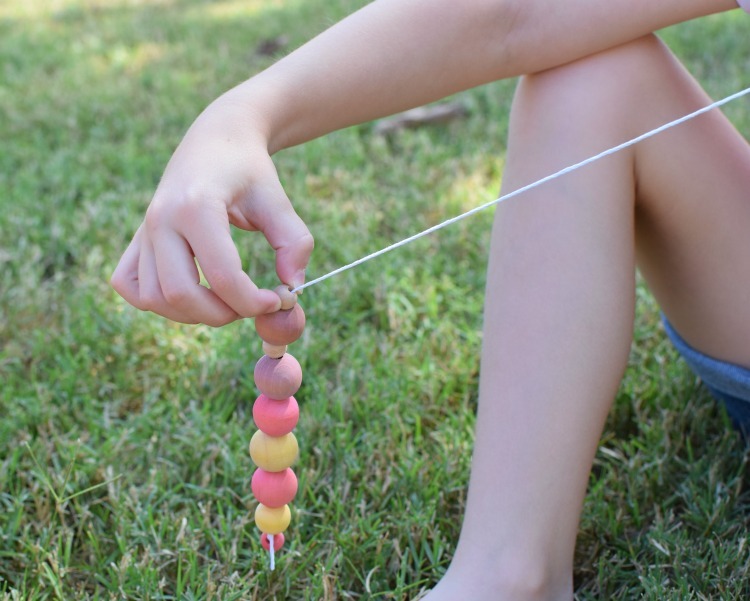 They were a big hit, and I'm pretty sure your kids will enjoy making them, too! 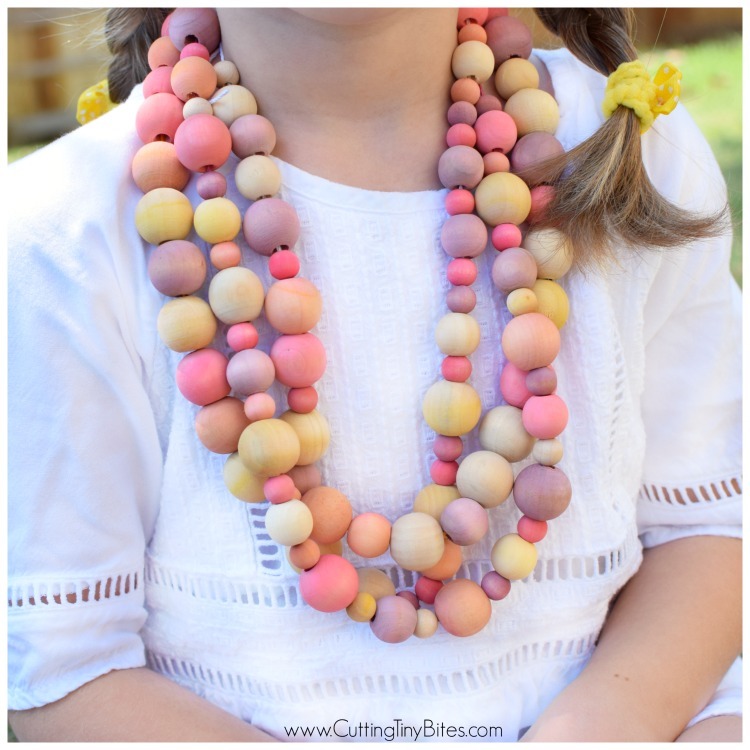 For this project, you'll need an assortment of wooden beads in a variety of sizes. I bought ours from a few different craft stores over several weeks as I had enough extra coupons! You also need some kind of necklace or lacing cord - I wanted to use a natural material for this project, so we used this hemp cord in fall colors. 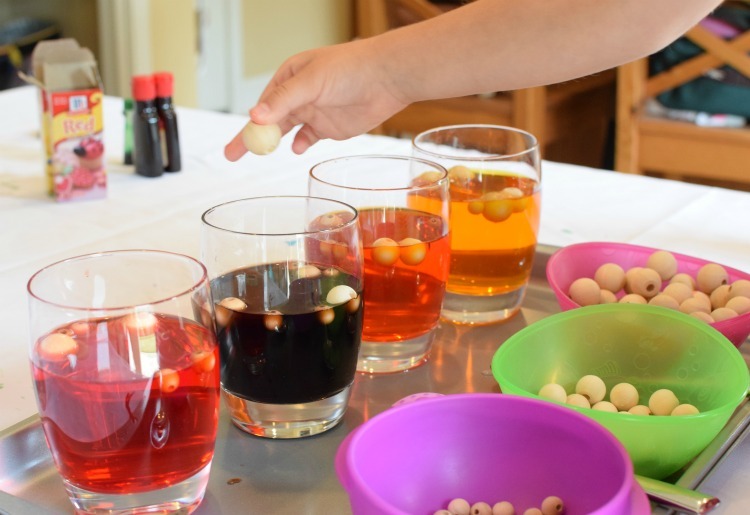 To dye the beads, you need some regular liquid food coloring and distilled white vinegar. 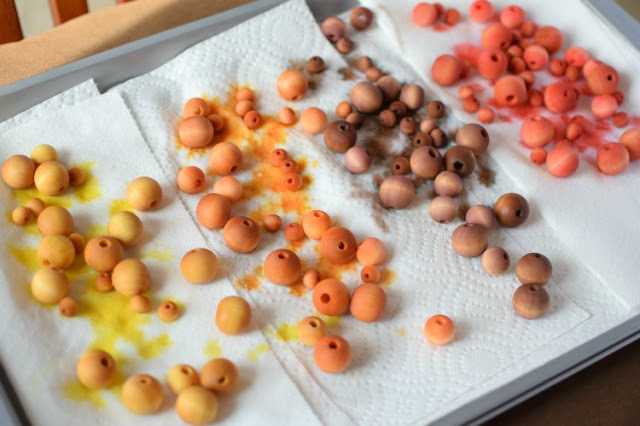 Dying the beads is basically like dying Easter eggs. 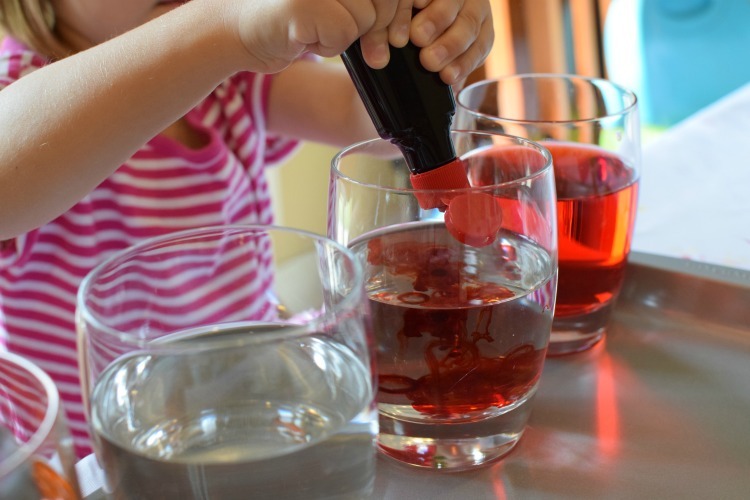 Mix equal parts vinegar and water in several glasses. Add a generous amount of food coloring. We ended up with about 30 drops of food coloring in each glass. 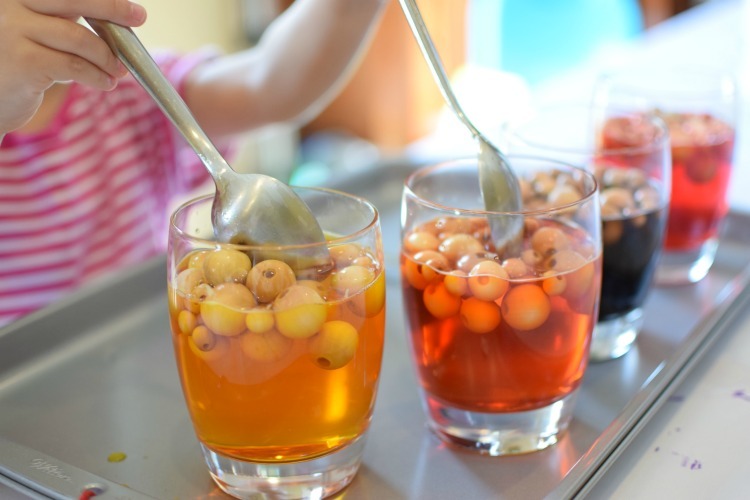 We made red and yellow, and then had a quick color theory lesson as we made orange and brown. Drop in the beads. I let my daughters take turns adding 10 beads at a time to any color they wanted. We also made sure to have a variety of sizes in each of the colors. 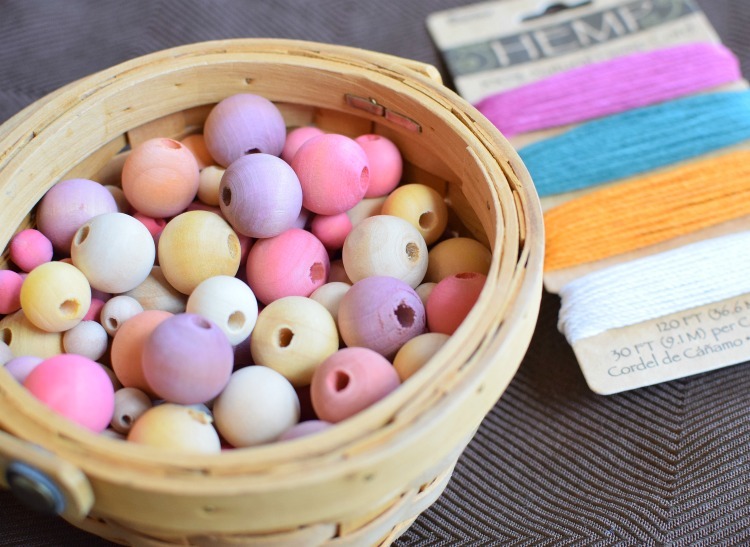 We also left some of the beads out of the dye so we would have some natural wood color in our necklaces. Give the beads a good stir and let them sit for about an hour. Stir occasionally to make sure that all the beads are covered well. 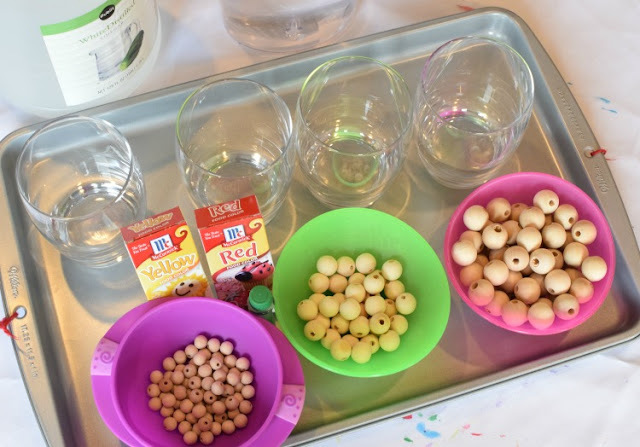 Scoop the beads out and place them on paper towels to dry. Aren't they pretty?! The color will fade a bit as they dry. I let ours dry overnight, but they'd probably be okay if you dyed the beads in the morning and let them dry until afternoon. Time to make necklaces! I gathered our beads and cord and we headed outside to enjoy some of the first fall weather that we've had this year. I always tie a bead like this at the end to keep the beads from slipping off. You can untie it when the necklace is finished so that you can tie the necklace ends together. 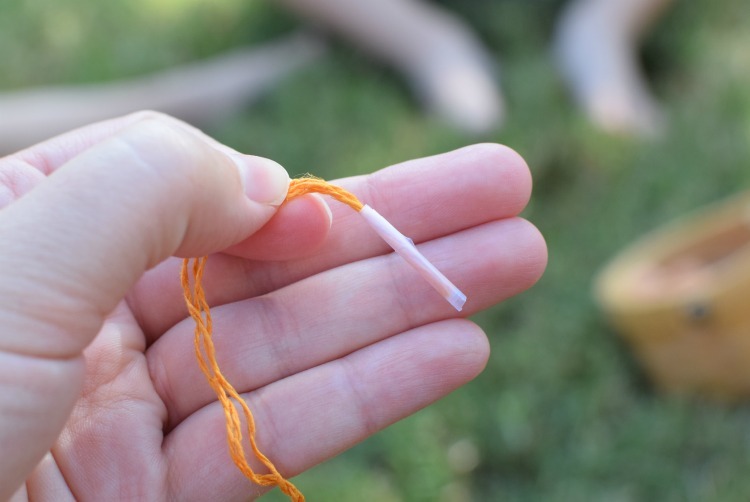 If you cord unravels, wrap the end in a little piece of tape to make a needle that will easily go through the beads. 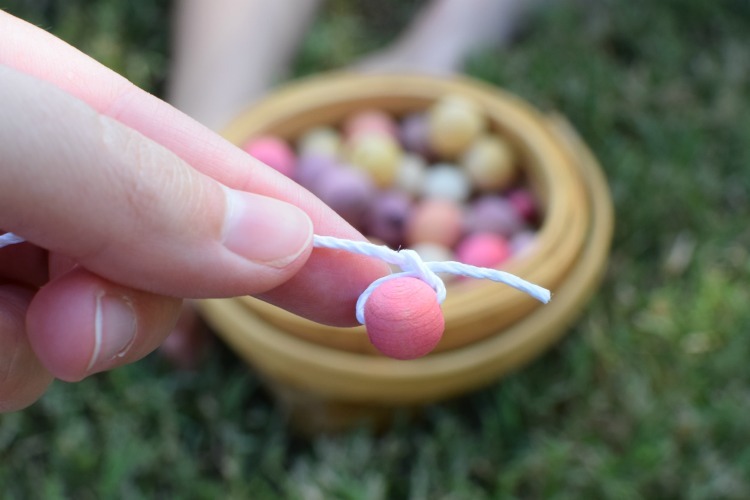 String the beads! 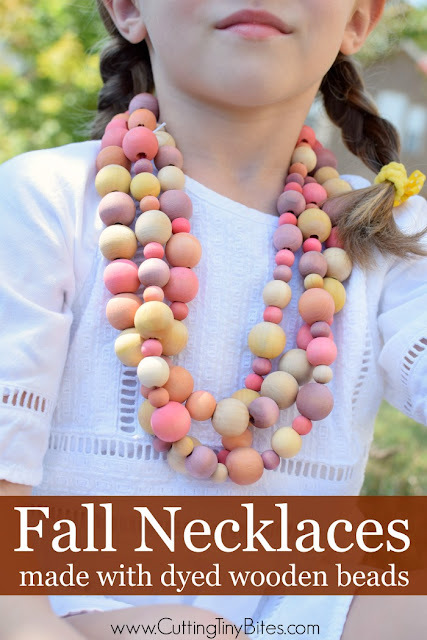 Your kids can make patterns if they like, or go wild and patternless! 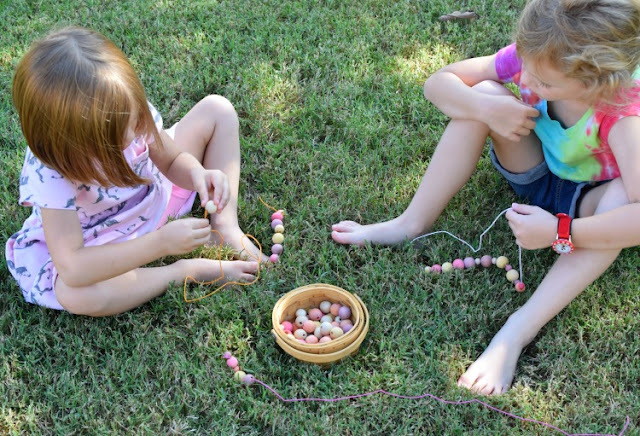 In addition to being just plain fun, stringing beads is great for fine motor development. Look at that pincer grasp (from my 6-year-old, but it still helps with handwriting)! Finish stringing your necklaces and tie the ends togther. Ta-da! Beautiful fall necklace craft made with dyed wooden beads. 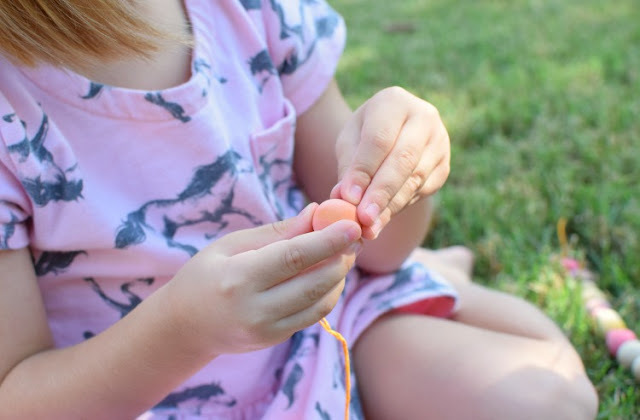 Great fine motor activity for preschoolers, kindergartners, or elementary children.